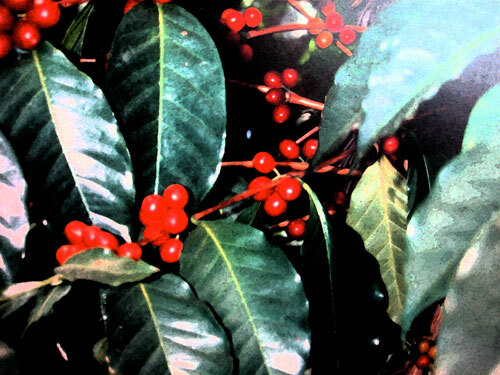 Coffee beans come from the coffee tree (actually it is a tropical evergreen shrub). It has the potential to grow to 100 feet, however it is kept much shorter for ease of harvest. The leaves look similar to the leaves of a laurel bush and the blossoms have a Jasmine like aroma. The average coffee tree produces an annual yield of 1 to 1 1/2 pounds of roasted coffee. It takes about 4,000 hand-picked green coffee beans to make a pound of coffee. 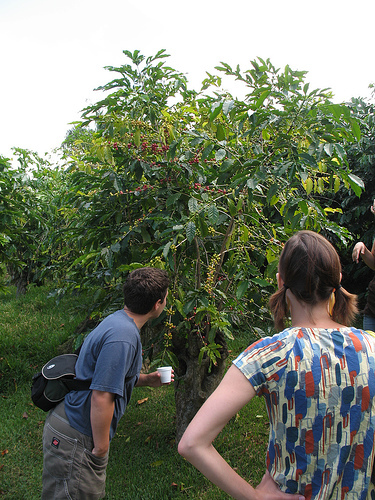 Coffee beans are really seeds or pits of the fruit called coffee cherries. These cherries are plump and bright red in color. They look like the cherries we eat, except each cherry normally contains two beans and there is less fruit pulp. An exception is the peaberry, which only grows one bean to a cherry. The coffee cherry has a thin skin with a slightly bitter flavor. Next, comes the fruit, which has a texture similar to a grape and taste quite sweet. The bean is protected by a parchment, which is covered with a slimy layer of mucilage. 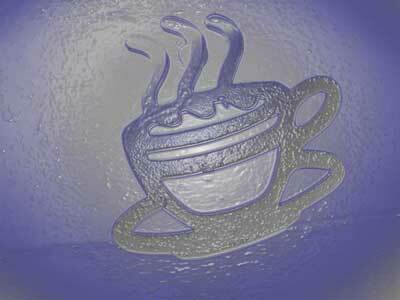 The coffee bean is bluish green in color and is coated with a thin layer called the silverskin. The tree grows in tropical regions, between the tropics of Cancer and Capricorn, that have abundant rainfall, year round warm temperatures averaging 70 degrees Fahrenheit, and no frost. It grows at altitudes ranging from sea level to 6,500 feet and above. It takes about five years for a coffee tree to bear its first full crop of beans. It will then be productive for about fifteen years. Growing coffee plants is difficult as the soil warmth is a critical factor, with the optimum temperature hovering at 27.7 degrees Celsius. Propagating the plant through cuttings is equally difficult and requires the maximum of light plus a humidity reading of close to 90%. Rooting can easily take three or four months. Robusta beans come from a high yield plant that is resistant to disease. It does best at lower elevations and has harsh flavors. It contains about 2 percent caffeine. It bears more coffee cherries than the arabica plant. It yields 2 to 3 pounds of green coffee a year. This plant is used for the lower grades of coffee that are sold in the market. Although generally not found in gourmet shops, robusta beans are often used in the processing of soluble (instant) coffees and popular commercial blends. Arabica beans do best at altitudes of 3,000 to 6,500 feet where the slower growing process concentrates their flavors. They have a much more refined flavor and contain about 1 percent caffeine by weight. Because of its delicate nature, it yields only 1 to 1.5 pounds of green coffee per year. This is the coffee that specialty roasters search for. It accounts for about 75% of the world production. Because the arabica tree is susceptible to disease, frost, and drought, it requires very careful cultivation with just the right climatic conditions. Liberica is the third recognized commercial variety, it is also hardy and low-altitude. It is a minor crop of coffee from Africa and is similar to robusta. The vast majority of coffee is grown in the coffee belt - The equator region from the Tropic of Cancer to the Tropic of Capricorn. Ethiopia - Much of the coffee is harvested from wild trees. Ethiopia Harrar - Believed to be the original coffee. Kenya - Graded by size: AA, A, B, AB. AA is the largest size. Most of the time, the largest size is the best. A delicious coffee from Kenya comes from the Chagga tribe, they grow it on the slopes of Mt. Kilimanjaro. Mocha - It was originally shipped through the ancient port of Mocha, which has since seen its harbor blocked by a sandbar. The term Mocha is an old-fashioned nickname for coffee, a common name for coffee from Yemen, and the name of a drink made up of coffee and hot chocolate in equal parts. India - Their specialty is Monsoon coffee. This is a process where the bean is stored in an open warehouse where the monsoon wind can blow through the place. This process is said to increase the body and reduce the acidity. Java - The best Java coffee is grown on the far eastern end of the island on five estates established by the Dutch government. Papua New Guinea - Cultivation started in 1937 with seeds imported from Jamaica's Blue Mountain region. It's grown in the valleys of the western highlands in the area around Mt. Hagen. 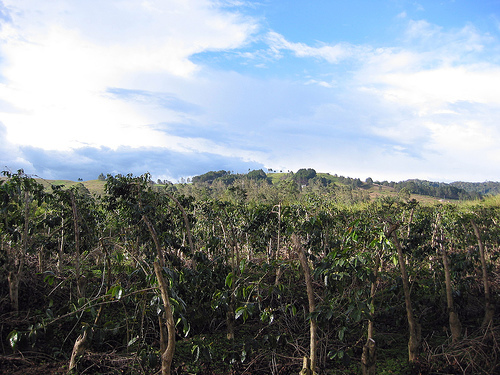 The rich soil and climate produce a mild and mellow coffee which many consider one of the world's best. Sulawesi - Grown and processed (dry process) in the Torajaland area near the town of Rantepao. This coffee is rare and, therefore, expensive. Sumatra - Most are produced using the dry process (see the section on Processing below). Timor - Categorized with the best of Sumatra and Java. Vietnam - mostly robusta coffee. Brazil - Brazil is the world's leading coffee exporter producing upwards of 35 percent of the world's coffee (22.5 million bags). A majority of the coffees that Brazil produces are relatively non-distinguishable in taste giving Brazil a fairly small portion of the gourmet coffee market. 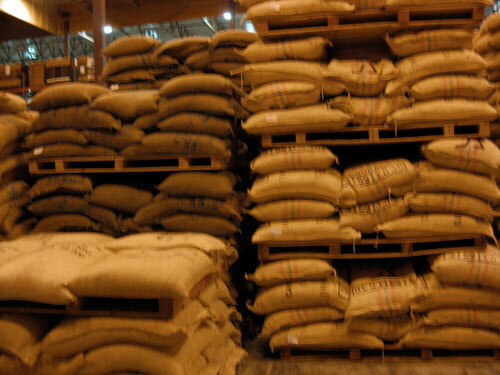 Colombia (10.5 million bags) - One of the world's favorites! Jamaica - Includes Blue Mountain, one of the most expensive coffees. Kona - Southwest coast of the island of Hawaii. 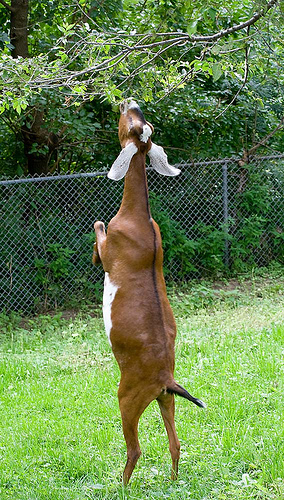 According to legend, coffee was discovered by an goat herder named Kaidi. He noticed that his goats become frisky and danced around the fields after chewing on the berries from certain wild bushes. He tried a few himself, and was soon as overactive as his herd. A monk walked by and scolded him for "partaking of the devil's fruit." However, the monks soon discovered that this fruit could help them stay awake for their prayers and became uncannily alert to divine inspiration. A second legend tells us that an Arabian named Omar was banished to the desert with his followers to die of starvation. In desperation, Omar had his friends boil and eat the fruit from an unknown plant. The broth saved their lives and their survival was taken as a religious sign by the residents of the nearest town, Mocha. The plant and its beverage were named Mocha to honor this event. The first drink made from the coffee tree was wine. It was made from coffee cherries, honey, and water. In fact the word coffee has its origins in an old Arabic word "Qahwah", meaning wine. It fell out of favor with the spread of Islam and its sanctions against the consumption of alcohol. 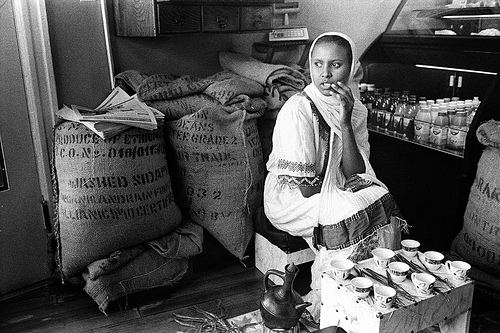 Coffee is indigenous to Kaffa region Ethiopia. It was taken to Yeman by the Arabs and cultivated there in the sixth century. The original coffee received its name from the Arabian port of Al Mukkah (Mocca) on the Red Sea. It became world famous because it was the sole source for the world's coffee. With the opening of the Suez Canal the port was by-passed for Aden at the tip of the Arabian Peninsula. Coffee has not shipped from Mocha in over 100 years. In the 1600's, smugglers broke the Arabian monopoly in coffee growing. They took seven seeds of unroasted coffee beans from the port of Mocha to the western Ghats of southern India. In the early 1700's, the Dutch began cultivating descendants of the original plants in Java. The Wet Method or Washed Coffee - This is used in regions where there is a plentiful supply of fresh water. A machine first strips away the outer layers of skin and fruity pulp. The beans, still enclosed in a sticky inner pulp and parchment wrapper, are soaked for 24 to 72 hours in fermentation tanks. This loosens the remaining pulp through a series of enzymatic reactions, which is then washed away. Time in the fermentation tanks is critical as too much or too little time will harm the beans. These coffees will generally have a higher acidity and cleaner flavors than their dry cousins. The Dry or Natural Method - The cherries are allowed to dry on the tree or are laid out to dry in the sun for three to four weeks. When the pulp has dried, a hulling machine strips away the outer skin and pulp. Although the beans are not always consistent in quality, the acidity of the beans is reduced and the body and earthy flavor is increased. Producing high quality coffee with the dry method is challenging because the beans are exposed to climatic conditions during the drying process. Some of the dry method coffees are Sumatra, Ethiopia Harrar, and Yemen. Semi-washed method - In Sulawesi, the coffee cherries are washed and sorted as in the washed method, but are not placed in fermentation tanks. Instead they are set out to dry. Sulawesi coffees are a bit more cleaner and smoother than their Sumatra cousins. After the wet or dry process, a mill removes any remaining parchment and the silverskin - a thin covering that clings to the bean. The coffee is then packaged in canvas bags normally weighing between 60 to 70 kilos (132-154 lbs) each, except for Kona coffee from Hawaii, which normally comes in 100 lb bags. While roasting coffee in a large commercial company is simply science, specialty roasters use both art and science to achieve the ultimate roast. Specialty coffee is roasted in small batches. The green coffee beans are placed in a hopper, which pours them into a rotating drum located on the inside of a roaster. The roaster is pre-heated to around 400 degrees F. by gas flames. It is kind of a cross between a hot-air popcorn popper and a clothes dryer. After five to seven minutes the beans turn yellow, indicating that they have lost about 12% of their moisture. Now they begin to make a crackling noise that reminds you of popcorn popping. They are actually popping open, which causes them to double in size. Since each variety and lot of beans requires a different roast length, consistent rapid-firing samples of the beans are taken during the roasting process. This is done by using a trier - a spoon-like prong that pulls samples of coffee from the roaster. Roastmasters uses both smell, sound, and sight to determine when the type of roast they want has been achieved. After about seven to nine minutes the beans "pop" and double in size, and light roasting is achieved. American mass-market roasters typically stop here. At ten to twelve minutes the beans reach this roast, which U.S. specialty sellers tend to prefer. After 12 to 20 minutes, depending upon the type of bean and roasting equipment, the beans begin hissing and popping again, and oils rise to the surface. Just before the beans reach their optimum color, they are released into a large metal pan called a cooling tray. Roasters from the U.S. Northwest generally remove the beans at this point. Large fans air-cool the coffee to room temperature in about four minutes. During this time period the coffee will darken one final shade. Commercial coffee makers roast their coffee for a short period of time, about 8 or 9 minutes -- Commercial Roast -- it saves money...in labor, fuel, and only 10% to 14% of the weight is lost during roasting as compared to 18% to 25% for specialty roasters. Also, the soft beans of lesser-quality beans would burn up if left in the roaster longer. This is called a cinnamon roast for the color of the beans. The green flavors of the under-roasted beans predominate and the full flavor complexities are not developed. Commercial coffees typically use a blend of lower quality arabica and robusta beans. Aliases: light, half city, New England, institutional. Flavor: Light-bodied and somewhat sour, grassy, and snappy. 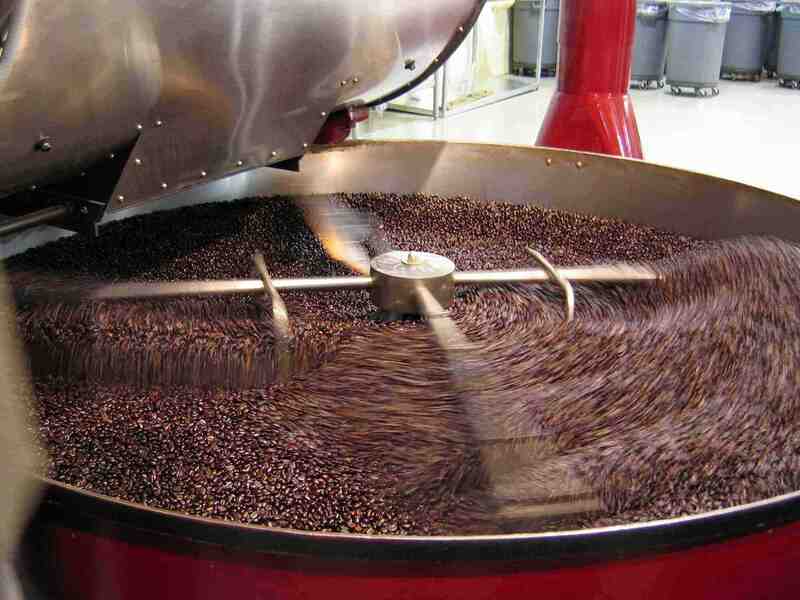 Specialty roasters use a city roast , where the coffee is roasted from 10 to 16 minutes. The color of the coffee becomes an even, light brown. This is used by most specialty coffee companies. Aliases: medium, American, regular, breakfast, brown. Flavor: A bit sweeter than light roast; full body balanced by acid snap, aroma, and complexity. 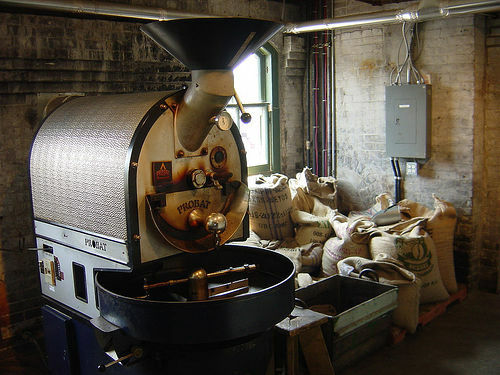 Some specialty roasters use a longer period of roasting, from 17 to 20 minutes, called a full city roast . The beans turn a rich chestnut brown with this type of roast. This allows the full flavor potential of the bean to be reached. Aliases: dark, high, Viennese, Continental. Flavor: Somewhat spicy; complexity is traded for rich chocolaty body, aroma is exchanged for sweetness. Two other roasts are the Italian roast and the French roast; where the color of the beans go from a chocolate brown to nearly black respectively. In a French roast, you mainly taste the roast, not the bean. The roast period can go as high as twenty-two minutes. Flavor: Smokey. Light - Always store the coffee in an airtight container that cannot be reached by light. If it is a clear glass container, then put it in cupboard. Moisture - Store coffee in a cool dry place. In the 17th Century, the first coffee house opened in London. These coffeehouses became known as "penny universities" because a person could buy a cup of coffee for 1 cent and learn more at the coffee house than in class! The London Stock Exchange grew from one of these coffee houses. In 1686 the first cafe serving coffee is opened in Paris - Le Procope... it is still in business today! In 1909 the first instant coffee was produced. Navy Secretary Josephus Daniels outlawed alcohol on board ships. He ordered coffee become the beverage of service on the ships, hence the term "Cup of Joe" (cuppa joe). Because sailors are generally cold, they wanted their coffee hot. The term hot cup of joe was use, then it was shorten to hot joe, then hojo. Europe was cut off during war time and Napoleon's countrymen had to drink chicory instead of coffee. Chicory does not have caffeine - probably why he lost at Waterloo because his soldiers were not wide awake enough to win. Coffee was once believed by some Christians to be the devil's drink. When Pope Vincent III heard about this he decided to taste it before banishing it...he enjoyed it so much he baptized it, saying "Coffee is so delicious it would be a pity to let the infidels have exclusive use of it." In 1475 a Turkish law was enacted that made it legal for a woman to divorce her husband if he failed to provide her with her daily quota of coffee. In 1732 Johann Sebastian Bach composed his Kaffee-Kantate. Partly an ode to coffee and partly a stab at the movement in Germany to prevent women from drinking coffee as it was thought to make them sterile. "Ah! How sweet coffee taste! Lovelier than a thousand kisses, sweeter far than muscatel wine! I must have my coffee."